Besides gelatine, GME members also manufacture collagen peptides, which finds application in the health, food and cosmetic sectors. Through their technological and commercial uses, collagen peptides – also named collagen hydrolysates – are versatile in their applications and play an important role in modern health programmes. Their purity and neutral taste make collagen peptides valuable ingredients for functional foodstuffs, pharmaceutical applications or cosmetics. Just like gelatine, collagen peptides are pure collagenous proteins; however, they are not able to gel. Collagen peptides are a white, odourless powder that is neutral in taste and highly soluble in cold liquids. It emulsifies, foams, adds consistency and binds. Similar to gelatine, collagen peptides are derived from Type 1 collagen through a hydrolysis process. This is the same type of collagen that can be found in human skin and bone. Protein makes up 97 per cent of this natural product. On a dry basis, collagen peptides contain a total of 18 amino acids, including 8 of the 9 essential amino acids. The amino acids glycine, proline and hydroxyproline are the most prevalent in collagen peptides, making up 50 per cent of its total amino acid content. This special mix of amino acids gives collagen peptides several functional properties. How does it differ from gelatine? In contrast to gelatine, collagen peptides have not been shown to have gelling capabilities. This is due to its low molecular weight. From a technical standpoint, this is a critical distinction: gelatine is made up of relatively long chains of amino acids , collagen peptides out of short chains (which are known as peptides). The latter enables a very high degree of biological availability, since small peptides can be taken up by the bloodstream through the intestinal wall. Its shorter peptide chains keep collagen peptides from establishing cross links, which are necessary for gelling. For this reason, collagen peptides can simply be dissolved in cold water and does not first require swelling and heating. This has no effect on its other properties, such as emulsification, binding or foaming. What makes collagen peptides so unique? The most important properties of collagen peptides are its unparalleled benefits for the health and care sectors. This is why it has become a key ingredient in the functional foodstuff (beverages, dietary supplements) and cosmetic industries. The benefits of collagen peptides for health and beauty have been confirmed and recognised for years. Scientific studies have shown that 10 grams a day or even less have a positive effect on joint, bone and skin health. Collagen peptides have been subject to scientific research and have been shown to be free of adverse side effects. It can simply be integrated into the conventional manufacturing process of the respective product. What are the most important areas of application? Collagen peptides, natural protein, are particularly beneficial to bones and joints because it contains large concentrations of the amino acids glycine and proline. Both of these amino acids are vital to the development of joint cartilage, which suffers if joints are subject to great stress. When compared with other hydrolysed proteins such as soy or whey, collagen peptides do not have a bitter taste that needs to be masked in the final product. Furthermore, in contrast to other proteins (milk, soy, etc. ), collagen peptides are not known to have an allergenic potential. 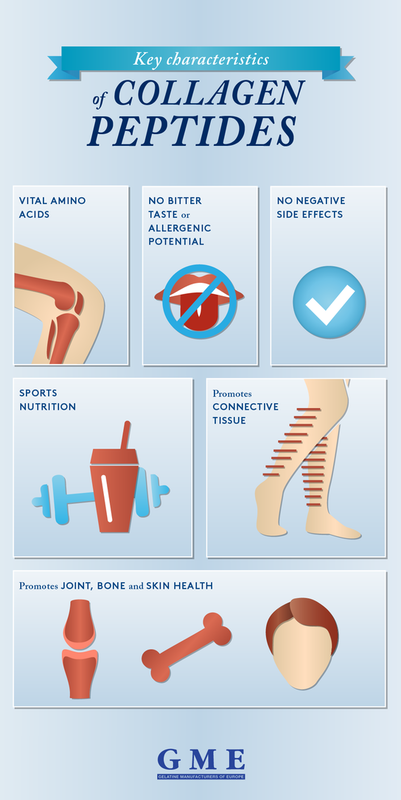 In contrast to other ingredients that are beneficial to joint health, collagen peptides have no negative side effects. Collagen peptides are an important ingredient in sports nutrition, for example in such products as protein bars or shakes. Since it is so similar to the proteins found in the human body, it is easily absorbed by the body for use in its processes. Collagen peptides are beneficial to the connective tissue, ensuring taut and firm skin. When taken orally, the natural protein is absorbed immediately into the bloodstream and transported directly to the body parts that need it, the connective tissue. Studies have shown that 10 grams of collagen peptides per day are sufficient for adults to enjoy the benefits on joint, bone and skin health.